Cataglyphis bombycina is known to be a "eusocial" insect due to the way it socially interacts. Most "eusocial" insects form colonies, in which the females either become workers or queens. However, the males are, for the most part, only used for reproduction (Encyclopedia of Life 2013). An example of another "eusocial" insect is the Solenopsis invicta, also known as the Red Imported Fire Ant. To learn more about the Red Imported Fire Ant click here. Members of the Eukarya domain possess a true nucleus within its membrane bound cells. Another eukaryotic organism is the Thunnus alalunga, whose common name is Albacore Tuna (Encyclopedia of Life 2013). To learn more about the Albacore Tuna click here. 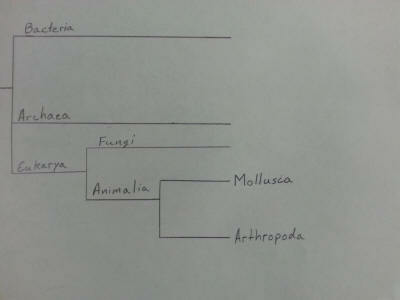 The kingdom Animalia consists of organisms that are heterotrophs. In other words, they consume other organisms to obtain energy. They are also multicellular organisms, which is a requirement for the kingdom Animalia (Encyclopedia of Life 2013). There is a a plethora of organisms that are in the kingdom Animalia, Lucilia sericata also known as the Green Bottle Fly is a member of this kingdom. To learn more about the Green Bottle Fly click here. To be a member of the phylum Arthopoda, an organism is required to perform ecdysis, or better known as molting, where the organism sheds its exoskeleton to further develop. It also has to have segmented limbs and a chitinous exoskeleton which are both traits for the phylum Arthropoda (Encyclopedia of Life 2013). Chionoecetes opilio also known as the Snow Crab is a member of the phylum Arthropoda. To learn more information about the Snow Crab click here. C. bombycina belongs in the Eukarya domain because it has true nuclei in its cells. The Eukarya domain also has membranes that surround its cells. It also belongs in the Animalia kingdom because it is a multicellular heterotroph. Since, C. bombycina has segmented legs, a chitinous exoskeleton, and performs ecdysis it can classified under the phylum of Arthropoda. Organisms that are a part of the class Insecta have three body sections including a thorax, head, and abdomen. They also have three pairs of legs (Encyclopedia of Life 2013). There are many organisms that are a part of the class Insecta. Another organism that is a part of this class is Anopheles earlei, or commonly known as the Mosquito. More information about the Mosquito click here. Hymenoptera includes insects with well-developed mandibles, such as; wasps, bees, and ants. The adult sizes are between 0.5mm-5cm long. C. bombycina is part of the sub order Apocrita due to the narrow petiole formed between the first two segments. The first abdominal segment is fused to the thorax (Encyclopedia of Life 2013). The Eastern Carpenter Bee is part of the order Hymenoptera. If you want to learn more about the Eastern Carpenter Bee click here. C. bombycina is a part of Formicidae because they have elbowed antennae and a narrow node-like structure for a waist called petiole. The Formicidae family is made up of ants (Encyclopedia of Life 2013). Genus Cataglyphis is made up of desert ants, therefore, C. bombycina is a desert ant (Encyclopedia of Life 2013). C. bombycina is known in English as the Saharan Silver Desert Ant. The silver coating on its body helps to protect it from the harsh sun in the desert (Myers 1995). C. bombycina is in the Arthropoda phylum because it has three pairs of legs and three different body sections. It also belongs to the Hymenoptera order because it has well-developed mandibles and an adult size between 0.5mm and 5cm in length. It belongs to the Formicidae family because it is an ant and has elbowed antennae. The reason its genus name is Cataglyphis is because it is a desert ant. Lastly, it has the species name C. bombycina, which translates to cotton, or C. bombycinus, which translates to silk. This is probably because it resembles the ants silver coating.